What was the connection between Steve McQueen, Sharon Tate, and Charles Manson? 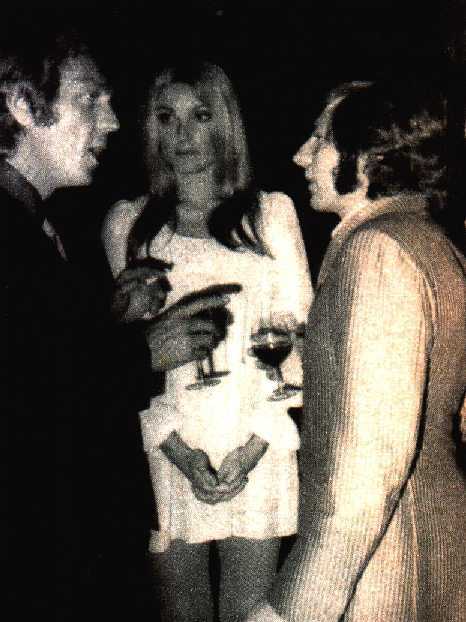 Steve McQueen, Sharon Tate, and Roman Polanski. McQueen dated Sharon Tate for a short time. Steve McQueen said he was supposed to visit her on August 8, 1969, the night members of the "Manson Family" (Charles "Tex" Watson, Susan Atkins, and Patricia Krenwinkle) entered the house and killed her. Also murdered inside the Polanski home were Jay Sebring, friend and hair stylist to McQueen, Abigail Folger, Wojciech Frykowski.. Charles Manson claims he made no one murder and that they did it on their own. Jay Sebring was not only good friends with McQueen, but in her book "My Husband My Friend," Neile Adams states he supplied McQueen with drugs. It was implied that McQueen sent others over to Sebring's house to rid it of drugs after he heard of his murder. From the book "Helter Skelter:"
"On hearing of the deaths, actor Steve McQueen, long time friend of Jay Sebring, suggested that the hair stylist's home should be rid of narcotics to protect his family and business. Though McQueen himself did not participate in the "housecleaning," by the time the LAPD got around to searching Sebring's residence, anything embarrassing had been removed." Steve McQueen gave a brief eulogy at Sebring's funeral. It was also reported that one or more of the "Manson Girls" and/or Charles Manson had a list of celebrities they wanted to kill and McQueen's name was on the list. Susan Atkins mentioned the supposed list to her cell-mate while in jail on another charge. From Helter Skelter: "For Susan Atkins, in one spurt of non-stop talking, gave her a death list of persons who would be murdered next. All were celebrities. She then, according to Virginia, described exactly how Elizabeth Taylor, Richard Burton, Tom Jones, Steve McQueen, and Frank Sinatra would die." However, Charles "Tex" Watson, in his book "Will You Die For Me," stated that "Susan Atkin's claim that there was a death list of famous Hollywood stars was untrue." Many people in Hollywood at that time have said they were supposed to visit the home that night for a party but decided against it. 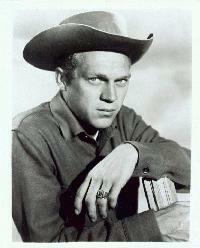 It has been said that Steve McQueen was to visit Tate on the night of the murders. But relatives of Sharon Tate reported that no visitors were expected at the Polanski residence on that particular night. From "Helter Skelter:" "If one believed all the subsequent talk, half of Hollywood was invited to 10050 Cielo Drive for a party that night, and, at the last minute, changed their minds. According to Winifred Chapman, Sandy Tennant, Debbie Tate and others close to Sharon, there was no party that night nor was one ever planned." 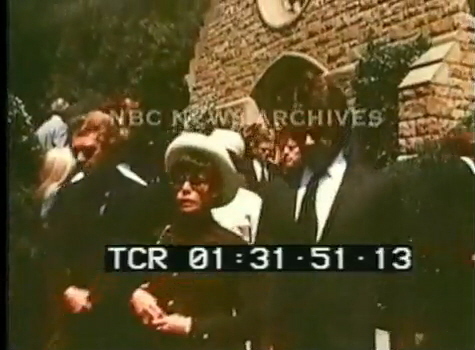 McQueen and first wife Neile Adams at Jay Sebring's funeral. 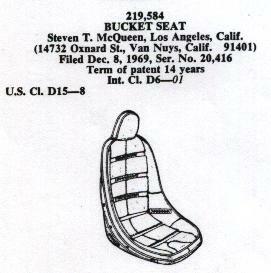 Did Steve McQueen design and patent a race car seat? Here is the listing of the seat from the Official Gazette of the United States Patent Office. What year was Junior Bonner made, and did Steve do his own riding? 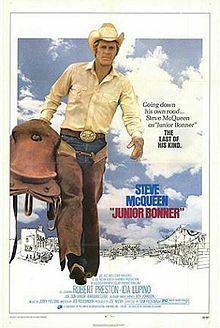 Junior Bonner was made in 1971 and Steve did all his own riding in the movie, which earned him an honorary membership in the Stuntman's Association. What happened to the original gun that was used in Wanted: Dead or Alive? I've been told that there were several Winchester Model 92's used in the series. One is on display at the Autry Museum of Western Heritage (Thanks to Jonathon Campbell for letting me know of this confirmed sighting!). 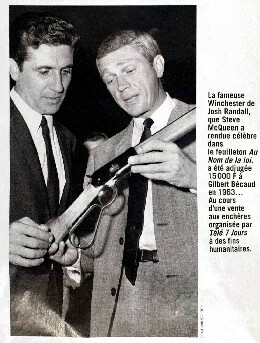 Michel Pisano from France writes that French Singer Gilbert Becaud aquired the gun from Steve McQueen at a charity auction. At the time, the price paid for the gun was 15000 francs, which is about. 2500 euros, or $3556 dollars. Of the others, rumor has it that one is on display in a restaurant (name unknown) in California, and singer Waylen Jennings has one. UPDATE: One of the guns was sold at auction in France on Dec. 1, 2014. It was owned by actor French actor Alian Delon and went for $23,700. 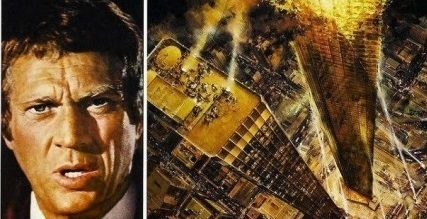 He made over 14 million dollars for his appearance (which was a huge sum in 1974) and Steve became the highest paid movie star of his time. How long was Wanted: Dead or Alive on television and how many episodes were made? The series went on the air September 1958 and lasted until May 1961. 117 episodes were made. Where was Steve McQueen when he passed away? The Santa Rosa Clinic in Juarez, Mexico. What was the name of the U.K. musical group that named one of their albums after Steve McQueen in the 80's? The name of the group is "Prefab Sprout." The title was Steve McQueen, but due to a conflict with the McQueen Estate, which didn't want the band to use McQueen's name, the album's title in the U.S. release was changed to "Two Wheels Good." 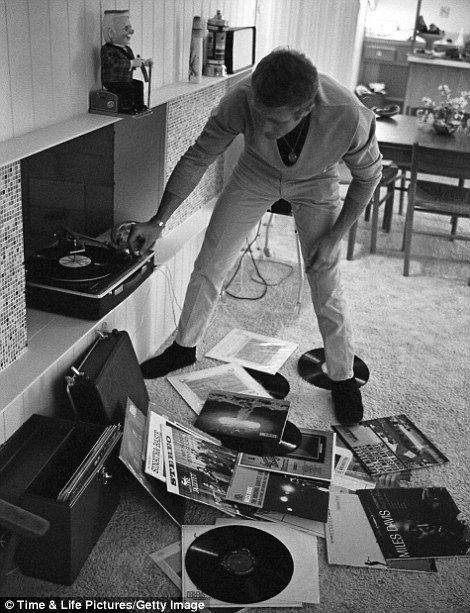 There are many music references to Steve McQueen. To see a few, Click HERE.